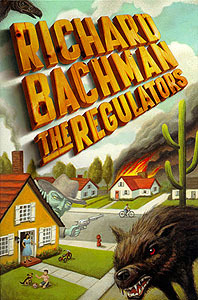 The Regulators is a novel by Stephen King under the pseudonym Richard Bachman. It was published in 1996 at the same time as its "mirror" novel, Desperation. The two novels represent parallel universes relative to one another, and most of the characters present in one novel's world also exist in the other novel's reality, albeit in different circumstances. Additionally, the hardcover first editions of each novel, if set side by side, make a complete painting, and on the back of each cover is also a peek at the opposite's cover. King had previously "killed off" Bachman after the pseudonym was publicly exposed around the time of the 1984 release of the Bachman novel Thinner. However, on the book's jacket and in a tongue-in-cheek introduction by the book's editor, it was alleged that this 1996 work was written by Bachman years earlier, but the manuscript had only recently been discovered by his widow in a trunk. The novel began as a screenplay titled The Shotgunners. King says that film writer-director Sam Peckinpah read the script made some suggestions, but Peckinpah died while King was writing the second draft. The story begins with a paper boy named Cary Ripton being shot by a mysterious stranger in a red van while making his rounds. Author Johnny Marinville and ex-cop Collie Entragian attempt to contact the police about the body, but an otherworldly force prevents the call from going through. As Collie makes his call, the residents notice yellow and blue vans around the neighborhood. Shortly after, residents Mary Jackson and David Carver are killed by more of the vans. The adults and children scatter and break into two groups: Johnny, the Reed family, the Josephsons, and David Carver’s widow and children. Meanwhile, Collie, the Geller family, a convenience store clerk, widower Peter Jackson, and a lost motorist named Steve Ames take cover in veterinarian Tom Billingsley’s house. Marielle Soderson has her arm mangled by gunfire as she and her husband Gary run to Tom’s house. Meanwhile, Ralph Carver identifies a pink van involved in the attack as “Dream Floater”. A letter written to an old friend by Audrey Wyler introduces her nephew Seth, who has mystical powers that have caused strange events around her household. Seth is also sharing a body with Tak, an interdimensional being who possessed him during a trip to the mining town of Desperation when Seth wandered away from a tour. Tak has committed many atrocities over the years, including driving Audrey’s husband to suicide, driving a neighboring family out of the neighborhood through means of psychological torture, and killing Seth’s birth family with the vans. Audrey is very afraid of Tak and has built a mental sanctuary from it, but she fears that the sanctuary will soon be breached. One day, when trying to escape her house, Audrey is caught by Tak and beaten for trying to escape. Meanwhile, the attack survivors are trapped in the house by vans. The refugees at the Carver household find what looks like a gun bullet on the ground, but cannot figure out how it would be fired, one even comparing it to a “child’s drawing”. Meanwhile, Tom and several others try to heal Marielle’s arm. It is later revealed to the reader that the vans are from the TV cartoon “MotoKops 2200”, and that the good and evil characters made a temporary alliance to end a threat to Earth. Survivors from the Carver and Billingsley households maintain a dialogue and share what little they know about the vans. As they talk, the vans block off the road in front of the houses and open fire, trapping the two groups inside of their homes. During the barrage, Audrey notices that reality is being bent by Tak, who promptly brings survivor Peter over to his home. Additionally, Johnny notices that an occupant of one of the vans looks like an action figure found on the floor of David’s room. Outside, the town is turned into one from an Old West movie. As the change happens, Collie and Steve volunteer to go a block over to seek help. In the Carver house, Johnny and the Reed twins, decide to go and look for a phone to call the police. Marielle’s suturing operation succeeds. Collie and Steve get weapons from Tom and prepare to leave on the mission. At the same time, Johnny and the Reed twins set out on their mission, but not before Ralph Carver identifies the action figure and vans as being from “MotoKops 2200”. Collie and Steve see reality begin to change into the world of “The Regulators”, an old Western movie. Johnny and the Reeds run into the two, and Collie is shot and killed by Jim Reed in a tragic misunderstanding. Johnny and the boys are then attacked by a mountain lion. A portion of the screenplay for “The Regulators” is presented in an interlude. In it, the movie’s antagonist announces his intent to “wipe this town off the map”. Back in the present, the mountain lion is dispatched by the group. Jim commits suicide out of guilt for his role in Collie’s death. Tom meets up with Audrey, who managed to escape the house with Seth’s help. The two decide to go to Tom’s house. At the same time, Peter is made to kill himself on a cactus in a gruesome display of Tak’s power. The two groups of survivors meet in Tom’s house and are told about Tak’s plan by Audrey, who claims that it comes from the “MotoKops” show. Audrey also informs them about the Regulators and the past strange events. As they talk, the Regulators and vans arrive and begin to destroy the town. The survivors find cover in Tom’s house, which is decimated around them. After a long period of time, the gunfire weakens and eventually disappears completely. The survivors look out of the house and find that the vans have vanished too. Audrey leads everyone across the street into her house, where she reveals that she used laxatives to purge Tak from Seth’s body in the form of smoke. Cammie Reed kills Seth and mortally wounds Audrey as Tak tries to sneak back into the boy’s body. Tak’s attention is diverted to her, and it flies into Cammie’s body. But she cannot hold up to Tak the way that Seth could, and her body is destroyed as a result of the possession. Tak leaves her in the form of smoke and dissipates in the wind. A short epilogue in the form of a letter reveals that Seth’s and Audrey’s ghosts have taken up residence at the meadow from Audrey’s sanctuary, and live there happily. In the novel's epilogue, a letter written by a woman on her honeymoon to her friend mentions one of Stephen King's earlier works, The Shining. "You're the only person I know who's read not just one copy of The Shining to tatters, but two!" "...although I don't suppose it's much like Stephen King's Overlook..."
As of August 14, 2014, there have been discussions about turning The Regulators into a TV series, per King's Twitter account. ^ "Stephen King on Twitter". Twitter. Retrieved 21 January 2015.